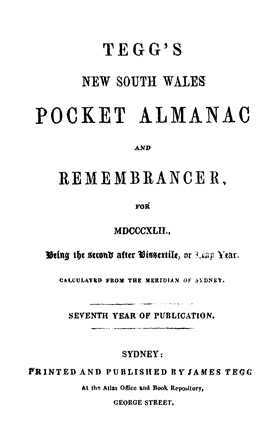 Tegg's 'New South Wales Pocket Almanac and Remembrancer' contains information on immigration, government, religious establishments, clubs and societies and postal information. It also includes rural and law calendars, a comprehensive list of roads throughout New South Wales and information on the Merchant Seamen's Act. It's an invaluable genealogy tool for anyone searching their family history or building a family tree.